Apple's App Store may have over 150,000 applications, but none have sold as many as Plants vs. Zombies in their introductory sales period. 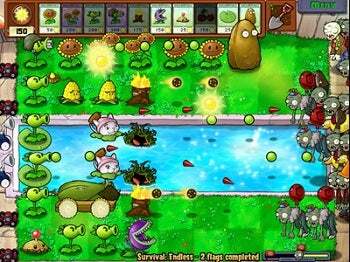 The so-called "cutesy" tower-defense game, which sees players wield imaginative botany against an army of backyard-invading zombies, originally launched for Windows in May 2009. The iPhone port just arrived last week. And according to publisher PopCap Games, the $2.99 mobile zombie-zapper is officially a mega-hit, selling over 300,000 copies in just nine days. That's a new record for the App Store, as is the game's revenue haul of over $1 million in gross sales. The game hit number one in "units sold" and "top grossing" categories on Apple's App Store charts inside 24 hours of launching on February 15, then managed to hold the top spot until yesterday. PopCap's done quite well for itself on the iPhone. The company says its mobile puzzler Bejeweled 2 is the first paid app to hit 3 million units sold, and that with Plants vs. Zombies' success, it can now boast three number-one slot-takers (including Bejeweled and Peggle). "Plants vs. Zombies is our latest major franchise to make the jump to iPhone, and from the early customer and critical feedback it appears to be a great adaptation of the game," said PopCap mobile business director Andrew Stein in a press statement. "There's always a concern when bringing a computer game to a mobile, pocket-sized device that something will get lost in the process, but in this case the overwhelming consensus is that Plants vs. Zombies is even more fun on the smaller touch screen!" I guess that means I'll have to try it. If you haven't, you can give the Windows and Mac versions a shake by clicking here, or check out the standalone iPhone portal here. And don't forget to read our own Laura Blackwell's review of the PC version here.